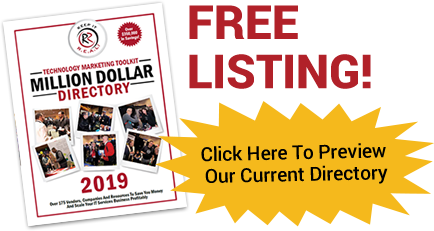 We’ve created and distributed a very unique “Million-Dollar Directory” to our members and subscribers – and we want to give you a free listing! Our members and subscribers are the CEOs and executive teams of IT services companies; specifically MSPs, MSSPs, VARs, solutions providers and IT services companies. What’s unique about this directory will be its focus on go-to-market resources, tools and resources that you and the 800+ vendors in the IT services channel bring. To that end, we want to know HOW you help your partners make more money, attract more clients and close more service contracts, as well as what marketing development funds and marketing assistance you offer, sales training and resources, workshops, events, etc. to help them close more business. This section will be for US TO COMMUNICATE TO YOU regarding this listing; you will have a different section to complete for the directory listing details. Upon completion, someone from our team will reach out to you to verify the information you provided, so you will have the opportunity to change or modify what you include here. What is the URL to get more information on your annual event? What is the URL to get more information on your "roadshow" event? Do you want to offer a special discount or other promotional offer to our community? If you don't know the exact value, please provide an estimate. Where can more details on your special discount or promotion be found? Who is your “Channel Chief" or Primary Point of Contact for new potential clients? What is the best way for reseller partners and/or clients to reach your Channel Chief or Key Contact above? What URL should someone interested in your services go to? Is there anything else you’d like to communicate to our community about you, your company? It is recommended to use a high-resolution image. If you don't have this image ready, you may submit this later.